When thinking about what I do, I realise I often make choices ‘in the moment’. I generally don’t think about things very long before I make a choice. Turning that around, I’m afraid it also means I don’t make a lot of decisions that require very long thinking… Probably, that’s partly because I’m a ‘present oriented’ kind of guy (see post “How to solve life’s puzzles? Understand your time perspective!“). Maybe it’s a good thing to not think about choices for too long? What? In our current society, we (read: the lucky ones) have almost limitless options, and our capitalistic ideology is promoting the generation of more options, more opportunities to consume. The amount of choices becomes so overwhelming, that it becomes harder and harder to make a choice. How? The overwhelming amount of choices makes us passive, we do nothing. Paralised by indicisiveness, we self-criticise over how we fail to live up to the ideal picture of the ‘self-made man’. Why? Because we have so many choices, we have to decide what we really want. What are our beliefs, values, and how can we stay true to ourselves? Who am I anyway? The combination of having too many options/choices and not knowing what you want creates anxiety. I choose what they choose because I’m afraid to be ridiculed for making my own choice. It’s easy to make a choice that other’s have made before. It can be to make the choice for the ‘ruling ideology’ for example. I want the ideal choice, so I investigate long and hard and weigh all the options, before I make my choice. It can mean that, if possible, I change my choices regularly to meet the ideal. Choosing is loosing options, so I don’t like to choose. My ideal is to have as many options as possible, so I have full control over my future. Choosing means choosing a path that I might not like further along the way. 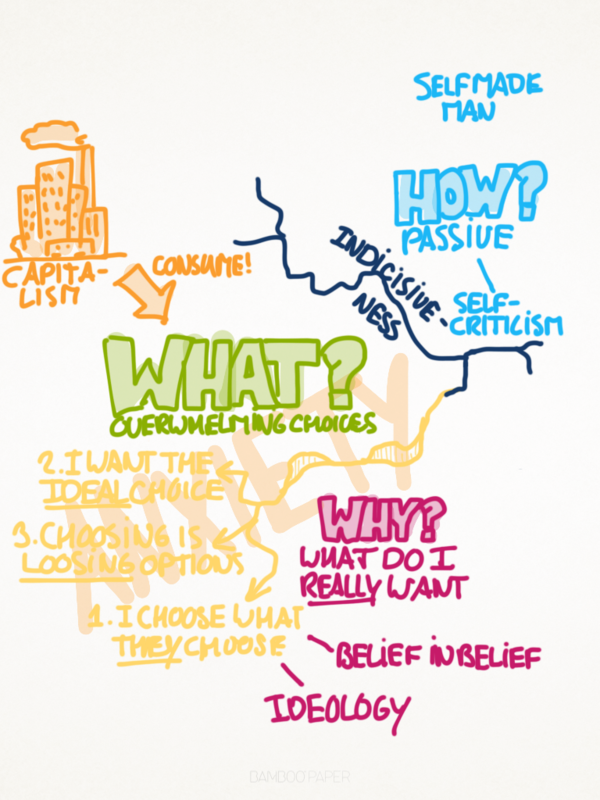 From a personal point of view, the more choices we have, the more we realize that we’re dissatisfied with our options. I think this problem comes from the fact that we’ve moved into being consumers and service oriented, instead of makers. I know that is more from a business stance, but I think it moves into our personal lives as well. Personally, I believe that having more options actually makes it harder to learn about yourself, because we shift our focus externally. This is because it’s hard to know what we like. Press someone to define their ideal ‘x’, and they’ll give ambiguous answers (just look at dating profiles to see proof of that). I like to flip it the other way around. As I was telling a friend the other day – to know what you stand for, you must first know what you stand against. Understanding what you dont like, and what you dont like about it, will open up so many more doors. « How are you doing? It’s the journey that counts!